Spinning is a health rage that simply isn’t going to go away. That should not be a surprise to most indoor cycling enthusiasts who have already experienced some of the powerful benefits of this low-impact workout mode. 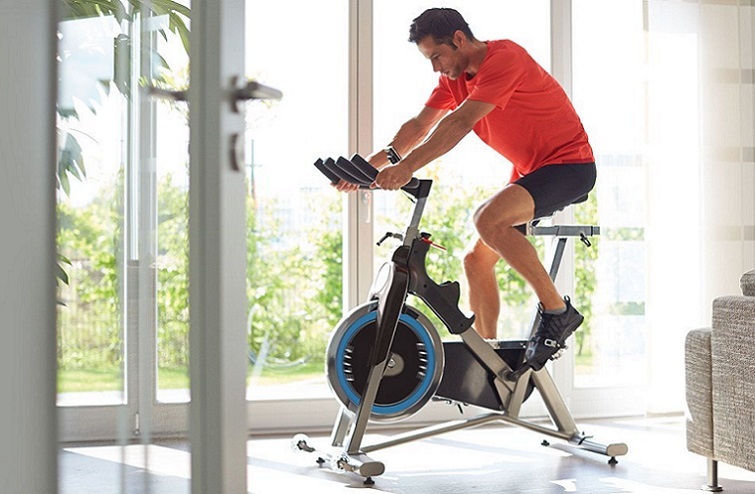 Because spinning classes have become crowded at the gym, indoor cycling is rolling into lots of homes. However, selecting the best indoor cycling bikes can be a challenge. Our reviews and buyer’s guide are designed to help you overcome that challenge. We’ll give you a close-up look of ten of the top fitness bikes to choose from in our reviews so that you can compare the features of each one. Along with our reviews, we’ve provided you with a buyer’s guide so you will have a real idea of what features to look for and the benefits of each one. As a bonus, we have added some tips on how to best use your indoor bike once you’ve brought it home and set it up. With those objectives in mind, let’s get started with our reviews. Those who are looking for the Cadillac of indoor cycling bikes will not be able to pass up the Keiser M3i Indoor Cycle. The quality and durability built into this bike place it on a higher level and its features make it stand out even further. This bike utilizes a lighter weight flywheel with magnetic resistance that is at the rear of the bike, which defies all of the design features that stationary bike manufacturers claim makes for a better bike. This bike is more dependable and requires a great deal less maintenance than a typical friction resistance bike. Its unique design allows for greater comfort bike and better body positioning and it is highly adjustable to fit a wider variety of statures and body types. Its console comes with some pretty impressive features as well. The handlebars and seat on this bike are widely adjustable and provide optimum positioning. This bike is lightweight and easy to move about or store. Its magnetic resistance allows for up to 24 different levels of resistance. Its console includes all of the relevant workout stats as well as programmed workouts and can be linked via Bluetooth to your Smartphone. The seat and pedals on this bike can be easily swapped out with your favorites from your road bike. The Mi3i sports a stylish and modern design that does not look out of place in any room. It comes equipped with transport wheels, a media tray, caged pedals, and a floor mat to prevent floor damage and prevent any movement. This is a quiet operating bike. It is backed by a solid three-year warranty. You are getting a Cadillac bike and you will pay a Cadillac price. The tools for properly assembling this bike can be hard to find if you are going to set it up by yourself. Smart trainer integration is somewhat limited compared to other consoles. The combination of stability and smooth spinning is what makes the Sunny Health and Fitness Pro SF-B901 Indoor Cycling Bike a solid choice among fitness cyclists. Beginners and experts alike can benefit from its wide variety of features which come at a price that fits most budgets. The handlebar shape on this bike allows for a wide variety of hand positions while you workout and this bike feature a good range of adjustment options for the handlebars as well as its the seat so you can optimize your position to get a great workout. Its wide range of friction resistance settings also allows you to adjust the intensity you want from your workout. A 40-pound flywheel positioned at the front of the bike helps provide a more balanced and smoother ride in whatever position or intensity you are riding. This bike is a sturdy built bike with enough weight capacity to handle the vast majority of users. Its 40lb flywheel provides a steady, smooth and balanced ride in whatever position you choose to ride. Handlebars and seat adjustments are easily performed from one user to another. You won’t have to deal with a lot of maintenance with this bike. Assembling this bike is pretty simple. It is a quiet operating bike that won’t interrupt others around you. There is a lot of value built into this affordable fitness cycle. This bike does not have a console for those who like to monitor their stats and program their workout. There are no brackets, trays, baskets or any other attachments to accommodate digital devices, water bottles or anything else. The handlebars do not adjust from horizontally, making it less accommodating for shorter users. If you are looking for a smart and sturdy indoor bike with commercial grade construction, then the L Now D600 is a choice to keep in mind. It provides the necessary features for a medium to intense workout to meet any fitness objective. The drop-down style multi-grip bars allow you to position your hands and arms just about anywhere while you are working out. It comes with a wide cushioned seat for greater comfort, and it and the handlebars have a wide range of adjustment options available. Because the handlebar stem tilts backward it is more accommodating to shorter users. It utilizes fully adjustable felt-pad friction resistance that can be adjusted to a wide range of difficulty levels. This bike is stable enough to support an impressive 400lbs (181.44kg) weight capacity. You get a fully functional LCD display console for monitoring your stats and programming your workout. The heavy-duty construction of this bike will support a weight capacity of up to 400lbs (181.44kg). Both handlebars and seat have a wide range of adjustments to fit multiple users. Multiple gripping options are available with the handlebars. The base on this bike has adjustable stabilizers for better balancing. Its specially designed seat promotes healthy blood circulation as well as comfort. This is a stylish bike with an appealing design. There are a wide variety of stats monitoring functions included in its console, which also includes EKG monitoring pads in the handlebars. This is a quiet, low maintenance bike that is easy to assemble. The console unit does not have backlighting. There are no accessory holders of any type on this bike. Its flywheel is a little bit small and might not provide the smooth ride of other spin bikes. Simplicity and stability come together in order to make the Sunny Health & Fitness SF-B1002 Belt Drive indoor cycling bike a viable choice for those who want higher-end options on an affordable bike. This bike adds some valuable improvements to the SF-B901 model. The major improvement that this bike makes to the earlier SF-B901 model is a belt drive system, instead of the chain drive system of the earlier model. This change allows for a quieter and a bit smoother ride that requires less maintenance. Another improvement is a 49lbs flywheel which also provides for a more realistic road bike type of ride. The handlebars and seat are adjustable to adjust a wide variety of users and it also provides for multiple hands and arm positions while working out. Its 49lb flywheel provides a steady, smooth and balanced ride in whatever position you choose to ride. This bike includes a water bottle holder. Its belt drive system provides for quiet operation that won’t interrupt others around you as well as a smoother ride. There is a lot of value built into this moderately affordable fitness cycle. There are no brackets, trays, or baskets to accommodate digital devices on this bike. The handlebars do not adjust horizontally, making it less accommodating for shorter users. 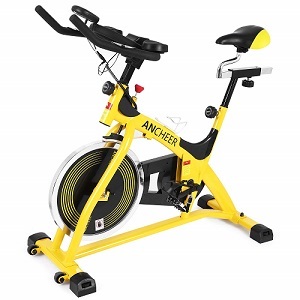 The Ancheer A5001 provides its users with a solid-built indoor cycling bike with a small footprint. This bike has a sporty design and plenty of top-of-the-line features to appeal to a wide variety of users as well as a wide variety of budgets. You get all the bells and whistles on this bike with some extras that don’t come on a bike of this price point. To start off with, you get a leather covered seat for added comfort and durability and it is adjustable in four different ways. The stem of the handlebars is tilted backward to support shorter riders. A digital LED monitor, which allows you to track time, speed, distance, pulse and calories is also included on this bike. Felt pads allow for unlimited resistance adjustment with this bike, allowing you to get an even better workout at each level. The solid built frame on this bike accommodates users up to 330lbs (149.69kg). Its base comes with adjustable, rubber leveling. You get a leather covered seat with 4-way adjustment. 2-way adjustment is available on the handlebars which tilt backward to accommodate shorter riders. Pulse sensors are integrated into the handlebars and connected to a multifunction LED display. Its 40lb flywheel helps provide you with a smoother riding experience. You get unlimited adjustable resistance with felt pad friction. This bike also comes equipped with a water bottle holder and resistance cords for an upper body workout while you ride. This is a quiet bike with a sharp, sporty design and it has a smaller footprint than a lot of indoor cycles. Users with an inseam that exceeds 32” will not fit on this bike. The handlebars do not accommodate multiple hands and arm positions while working out. There are no trays or baskets for electronic devices included on this bike. 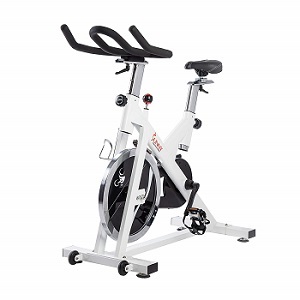 Another affordable, sturdy and straightforward offering from Sunny Health & Fitness is the SF-B1110 Indoor Cycling Bike. This bike has many of the same features as its earlier version SF-B901to accommodate a wide variety of users. 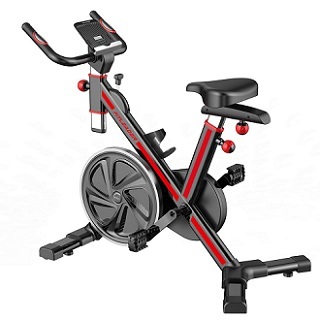 This indoor bike also includes a handlebar shape on this bike which allows for a wide variety of hand positions while you workout and this bike feature a good range of adjustment options for the handlebars as well as its the seat so you can optimize your position to get a great workout. Its wide range of friction resistance settings also allows you to adjust the intensity you want from your workout. A 44-pound flywheel positioned at the front of the bike helps provide a more balanced and smoother ride in whatever position or intensity you are riding. Its 44lb flywheel provides a steady, smooth and balanced ride in whatever position you choose to ride. There is a lot of value built into this affordable fitness cycle, which is backed by a 3-year warranty. The handlebars are too vertical and do not adjust horizontally, making it less accommodating for shorter users. You will be difficult pressed to find a lighter and simpler indoor training cycle with all of the features of the ProGear 100S for a lower price. This bike is loaded with features that will serve the budget conscious and is a great way for those who are still on the fence about spinning to take the plunge. Moving this bike around on its transport wheels won’t present a challenge to any healthy adult. It is a sturdy and well-balanced bike set on a solid steel frame. It includes a 22-pound front mounted flywheel with felt-pad friction resistance that can be easily controlled to a wide variety of difficulty levels. Its seat is easily adjustable to users with a wide range of heights. In spite of the fact that you get this cycle at a budget price, it is equipped with a backlit LCD display console that measures calories burned, distance, time, speed, pulse and scan. This is a solid beginner’s option to take into consideration. This bike has a sturdy lightweight frame that is adequate for supporting the vast majority of users. The 4-way adjustable seat can be easily adjusted to accommodate riders of various heights. It has a balanced, chain driven flywheel with felt-pad friction resistance for a wide variety of difficulty levels. It comes with a backlit LCD display console to monitor and track your stats while you workout. This is a quiet bike. It is easy to assemble, even for a beginner. You get this bike at a budget price and it is backed by a 1-year limited warranty. The handlebars do not allow for adjustability nor for a wide variety of hand and arm positions while working out. The seat on this bike is a little bit hard. The flywheel on the ProGear 100S is a little bit light and is likely to make your ride a little rougher than higher quality bikes. There are no baskets or trays provided for electronic devices that you might like to use while working out. 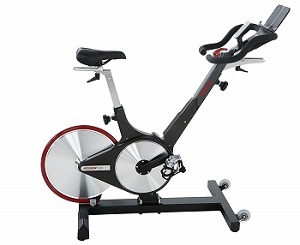 A smooth ride on a sturdy, gym quality spinning bike can be had on the Sole Fitness SB700 Exercise Bike. There are plenty of high-quality, appealing features on this bike which are built into the value of this indoor cycling bike. The steel frame that carries this bike is sturdy enough to accommodate riders up to 300 pounds. Its 48-pound flywheel is designed to provide its rider with a smooth and balanced ride and it is belt driven to make it extra quiet while in use. Difficulty levels can be adjusted using felt pad resistance. It comes equipped with 4-way adjustment on both the seat and the handlebars, which is a rare feature on most bikes in its class. The console on the SB700 is a well-lit, LCD display that monitors RPM, time, Kcal, distance, and speed, and comes with a wireless, chest-strap, heart rate monitor. This is a sleek and attractive bike that you will be proud to show off. This bike has a sleek and attractive design built on a solid metal tube frame that will accommodate riders up to 300 lbs (136kg). Its heavy flywheel (48lbs) will provide you with a very smooth, road bike quality riding experience. Friction resistance using felt pads allows for a wide variety of workout difficulty levels. It comes with a comfortable seat that is 4-way adjustable to fit a wider variety of rider sizes. The handlebars on this bike are also 4-way adjustable for even greater comfort and proper positioning. It has a well-lit LCD display console that monitors all of the most popular stats and comes with a wireless, chest-strap, heart rate monitor. It is equipped with transport wheels, which is important on this heavy bike. A 3-year limited warranty backs the quality level of this bike. This is a very heavy bike that will be difficult to move around even with the transport wheels. It is a little bit pricey for a friction resistance indoor trainer. There are no baskets or trays for holding the electronic devices that you are apt to be using while working out. Marcy is a well-known brand name in fitness equipment manufacturing and their production of the Marcy XJ-3220 Club Revolution Bike is a testimony to the reason why. There are some solid features included in this affordable fitness cycle to keep your interest. This is a chain driven bike built on a solid steel frame that accommodates users up to 300lbs (136kg). Adjustable, felt-pad resistance allows you to determine the difficulty of your workout and its 40-pound flywheel will give you a smoother, balanced ride. The XJ-3220 features a small footprint that is better suited for those with limited space available. It comes with a comfortable 4-way adjustable seat and adjustable handlebars that tilt backward to accommodate shorter riders. The handlebars also offer a wide variety of hand and arm positions while you workout. This is a bike that is a very strong contender for the tastes of beginners and experts alike. This bike is stylish and sturdy with a steel frame and welded joints that will support users up to 300lbs (136kg), but is surprisingly lightweight. Felt-pad friction resistance is easily adjusted to unlimited difficulty levels. This bike is a space-saver with its small footprint. It has a comfortable, 4-way adjustable seat that is easily adjustable to riders of different heights. The handlebars on this fitness cycle provide a wide variety of hand and arm positions while you are working out and are adjustable to suit riders of varying statures. It utilizes a 40lb flywheel for a smooth, road bike ride. It comes with a water bottle holder and transport wheels. This is a very affordable bike given its construction quality and features. Those who prefer to monitor their stats while they workout will be disappointed that this model does not include a display console. It is chain driven, so not as quiet as the belt driven models in its class. There are no baskets or trays to hold the electronic devices you might want to use while you are working out. The space-age look of Fitleader FS1 Indoor Stationary Exercise Bike has the potential to raise a lot of eyebrows. However, it is the quality of its construction and features at an affordable price that seals the deal. This is a unique bike in its price range because it is equipped with magnetic resistance that usually comes on higher priced bikes. It is made of solid steel construction that will accommodate users up to 293lbs (133kg). The seat on this bike is 4-way adjustable to suit a wide variety of rider heights. Its handlebars can also be adjusted for greater comfort and proper positioning while you’re working out. This bike is equipped with an LCD display that monitors time, speed, distance, calories burned, ODO, and RPM. Built-in sensors in the handlebars also allow the monitoring of your pulse. This lightweight bike is also equipped with transport wheels and a water bottle holder for added convenience. You get a sturdy, space-age designed bike that will accommodate users up to 293lbs (133kg) in the Fitleader FS1. The magnetic resistance flywheel and belt drive provide for lower maintenance on this bike. It comes with 8 levels of resistance so that you can adjust the difficulty of your workout. The LCD display console on this bike monitors all of the popular vital stats. Both the seat and handlebars can be adjusted to suit a wide variety of riders between 5’ and 6’-2” tall. Transport wheels and a water container holder are provided accessories on this fitness cycle. You can own this bike for a very reasonable price considering the value of the features included in it. The handlebars are a little bit too vertical and don’t adjust horizontally to overcome this issue. Advanced users who need a greater degree of difficulty from their workouts might not be satisfied with this bike. The design of the handlebars limits the variety of hand and arm positions while you are working out. The weight capacity of an indoor bike is a reflection of how solid the frame is. For obvious reasons, you want a bike that will support the weight of the heaviest person in your home who will be using the bike. The typical range is between 250 and 350 pounds. An important factor, which we will explain more in our best cycling bike tips, is your position on the bike. This not only helps you to feel more comfortable, but it helps to have your body in the proper position to get the best workout and prevents fatigue and stress-related injuries. Being able to adjust the seat and handles to the best position for the user’s specific stature is an extremely important feature to have on your bike. Having your calves raked by a piece of metal on a fast-moving bike doesn’t feel very good. Consequently, you will want your indoor cycle to have caged style pedals in order to keep your feet from slipping off when you’re hard at work. Make certain that these are made of a comfortable material (usually nylon mesh) and are easily adjustable to give you the best fit. A lot of people set up their bike and leave it where it is, but there are times when it needs to be moved from one place to another. Whether this is done regularly or occasionally, transport wheels help make this a whole lot easier. Most bikes come with these wheels attached. Though these items are not essentials, they usually make the difference between two bikes that are equal in all other ways. Indoor cycling bikes are not known to take up a lot of space, but if you happen to have a rather small area in which to set it up, knowing the dimensions of the bike is important. You will want to find a bike that not only fits the footprint you can provide for it but will provide enough clearance to safely mount and dismount. The weight of the bike is also a consideration to keep in mind. Most do not weigh enough to fall through a structurally sound floor on their own, even with your weight added to them, but if you should have to move your bike around, its weight will become a noticeable factor, even if it comes with transport wheels. 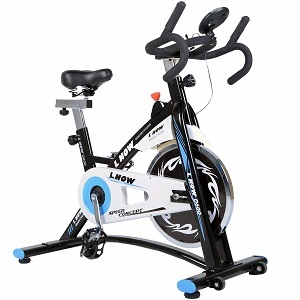 With the exception of a very few, higher end bikes, the flywheel on indoor cycling bikes is usually located in the front. Flywheel weight is what really makes the difference when it comes to giving you a smooth, road bike feel. Flywheel weights between 30 and 50 pounds provide the best ride. Flywheels heavier than 50 pounds will take a lot more effort to get started and won’t stop very easily. Resistance is what allows you to alter your workout level. Resistance is applied to the flywheel, in one form or another, in order to make it harder to pedal. Most bikes use felt pads to create friction, but they are more prone to wear, so higher end bikes will often utilize magnetic resistance to alter workout levels. Higher quality bikes will typically provide you with a minimum of 8 levels of resistance. Whether or not your indoor cycle needs a console is up to your personal preference. Those who like to keep anything simple will do just fine with spinning in time to their favorite tunes and being oblivious to any sort of speed, heart rate, calorie burning or other stats that are monitored on some bikes. Basically, if you are something of a stats or gadget freak, you will be more inclined to look for a console that displays lots of information. There are a lot of great benefits to be had through consoles that provide programmed workouts as well. Some will even link to apps on your Smartphone. Price and warranty come into play with any purchase. The two typically go together. Those with a longer warranty tend to come at a higher price, but the reason their warranty has longer coverage is that the bike is of higher quality, to begin with. Warranty is not always an indicator of quality, so you will want to be sure that you recognize the value of each of the features and what they add to the price of the bike as you compare various models. Using an indoor cycling bike can provide some awesome health and fitness benefits, but if you aren’t sure how to use one, or use it improperly, you might not get the benefits you are looking for. Here are a few tips concerning the best use of an indoor cycling bike. Adjust the seat height according to the height of your hips. Your leg on the lower pedal should be slightly bent at a 5 to 10-degree angle when the seat is properly adjusted. Adjust seat depth in such a way as to allow you to reach the handlebars while sitting in an upright position. Adjust the handlebars to a level that is above the height of the seat. You will want to be able to lean forward at a comfortable angle to prevent strain to your lower back when in a forward position, so you might want to play with this adjustment some until you come up with the height that best suits you. Watt. This is the amount of cycling power produced. RPM (revolutions per minute). This is your pedaling cadence. BPM (beats per minute). This is the measurement of your pulse or heart rate. Kcal (calories). This estimates the amount of energy used up during your workout. Using each of these indicators, you can set up various training modes. We’ll examine two of the most popular ones below. This is considered to be a classic indoor cycling workout and the one most often used for low-impact. It utilizes the RPM and Watt readouts on your console display to fashion the intensity of your workout. Cadence and power work in opposite directions. As for cadence increases, watts tend to decrease and when cadence decreases, watts tend to increase. Consequently, this type of workout allows you the opportunity to maintain a balance between these extremes so that one does not become too low and the other too high. The objective is to maintain a consistent balance between RPM and Watts as you increase and decrease resistance levels. An example would be a target RPM reading should between 80 and 100 while maintaining watts at between 100 and 120 watts. You can increase or decrease the intensity of your workout by maintaining these two levels while adjusting resistance. Calculate your maximum heart rate (MHR) using this simple formula. For men, MHR = 220 – your age; for women, MHR = 226 – your age. You will utilize your MHR to help target the intensity of your training intervals at a level between 80% and 90%. You can calculate this number by multiplying your MHR by .8 and then by .9. For example, if your MHR is 180, 80% is 180 x .8 = 144 and 180 x .9 = 162. During your high-intensity intervals, you will try to keep your heart rate between 144 and 162 BPM. You will want to set a timer, which why a timer on your console is a great addition, to a specific interval or look watch the second hand on a clock. You will execute a high-intensity interval for between 30 seconds and 1 minute in which you will maintain your heart rate between 80 and 90 percent of your MHR. Following the high-intensity interval, you will back off to a resting exercise of the same amount of time or half that amount of time, depending upon your fitness level. You will follow your resting exercise with another high-intensity interval, and then another resting interval. You will continue alternating between these two extremes for between 10 and 20 minutes, depending upon your fitness level. The most crucial thing to keep in mind while working out on an indoor cycle, whether doing cadence training or HIIT training is to keep yourself hydrated. To accomplish this, you should drink water or an electrolyte-rich liquid before during and after your workout. Hydration during a cadence workout can be done with longer periods between drinks, but with HIIT training it should be done more frequently during resting intervals. Before Workout. This should be something light without fats or proteins. Complex carbs are preferable to provide energy while burning off quickly. During a Workout. HIIT training will typically not allow for this and it usually pretty quickly over with anyway. For longer cycling workouts, cereal bars or high carb dehydrated fruits are typically good options. After Workout. Eating protein after your workout will help to repair and restore your muscle tissues without adding back those calories that you just burned off. Try to stay away from starches and carbs. Utilizing these eating and drinking tips can help you be more successful when it comes to meeting your fitness goals and objectives. Spinning at home is one of the best ways to maintain your fitness in and out of cycling season. Regardless of what your fitness goals include, an indoor fitness bike is a reliable, safe and enjoyable way to reach your targeted objectives. After considering the various features of the bikes in our review, we believe that one of the best indoor cycling bikes among them is the Fitleader FS1 Indoor Stationary Exercise Bike. The Fitleader FS1 features a smoother ride and more consistent and maintenance free resistance with its magnetic resistance feature. It is well-built with an appealing space-age design. It is equipped with the necessary seat and handlebar adjustments for optimum positioning and comfort and comes with a console that monitors all of the popular vital stats during your workout. This bike comes at an affordable price as well. Whether or not you agree with our choice, you should be well-enough informed to make a qualified choice when it comes to purchasing your indoor fitness bike. Keep our best use tips in mind for a safer ride and to achieve greater benefits as you enjoy spinning in your own home.